There's a new view from my living room couch. And it's blue! Remember like ten years ago a couple of months ago when I nervously asked all of my lovely readers whether or not I should paint our dining room navy blue? And you all emphatically said YES!? Oh, yes I did! It's navy blue now, folks. That is still wet paint on the walls! We finally got started on our random chair collection (remember my inspiration?) thanks to some hand-me-down chairs from my mom and dad. Thanks, guys! Now when we have friends over for dinner, they don't have to sit in lawnchairs at the dining room table! Ha, and you think I'm kidding! True story. The wall color is Behr's Starless Night. As you can see, I haven't painted the inside of our built-in wine rack or our plantation blinds (update: see below!) - they're both the original off-white color. 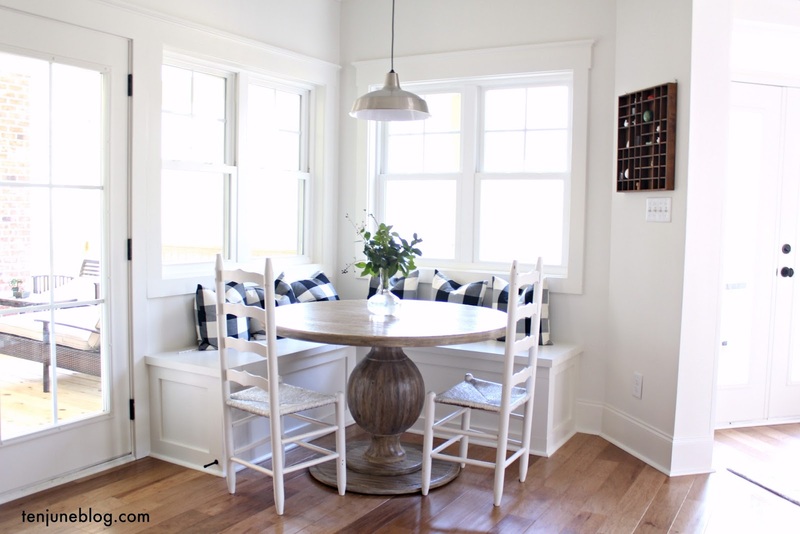 Isn't it crazy how yellow the plantation shutters look, now that the trim and beadboard is painted a bright white?! That beige color used to be our kitchen cabinet color! And actually is still the same color as the rest of our house's trim (we're repainting the trim bright white in each room, slowly but surely!). I must say that I couldn't have slapped this paint up without the help of my gorgeous sister! Thanks, Tori! Here are some shots of my new rug and the DIY sunburst mirror I created. And here's another update with the newly stenciled built-in wine rack. The navy blue was certainly a risk, but oh how I love it! It looks amazing! You guys did a great job. Your room sure has come a long way! LOVE the blue, it's so gorgeous! Well done! I love it! 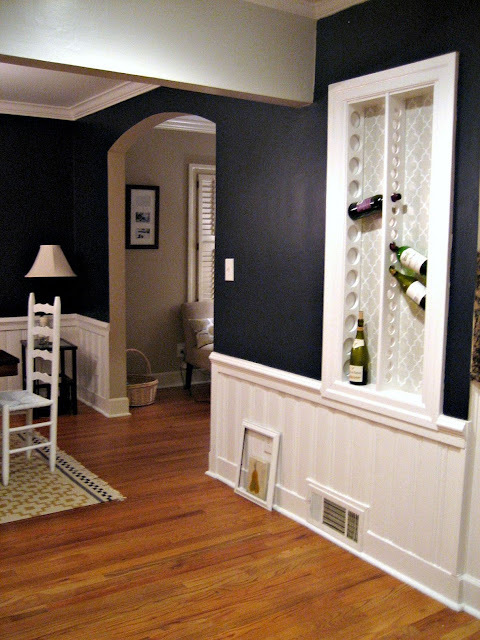 Love the navy blue....the way you did this with the beadboard on the bottom is just perfect!!! The navy looks so good! I'm actually jealous because that's what our media room was "supposed" to look like, instead it turned out Crayola blue. I'd love to have it repainted- notice I didn't say I'd love to repaint it myself! Ha! Kudos to you!! Y'all did a great job! I can't not get the song out of my head. ughhhh! I LOVE it. It's fabulous. You and your sister look a lot alike! So excited to see it all come together. I'm loving it! The navy and white look great together! Oh my gosh, I am loving this!! The navy looks amazing!! I can't believe how yellow those shutters look!! Crazy to think that they are "beige," but they seriously look yellow in the picture!! It's wonderful. The navy is so grown-up and elegant. I like warm and broody rooms in restuarants and dining rooms. I can see some candles in their with wine and dinner soon! WOW! That looks really stunning. What a statement. You've made a good choice. Amazing work. I'll say congratulations even if you got that annoying but catchy tune in my head. I can attest to the fact that dark paint tends to be hard to manage around white so well done. I'm sure it will be worth the effort. lookin good....i am loving this navy blue your so lucky that it is working for you! Wow!! your dining room looks beautiful. Nice color choice. can't wait to see how you accessorize this space. I was loving your light fixture against the lighter color wall but now... I see what you mean-- the room needs something else. Love your style!!! Can't wait to see what you decide for the wine rack & fabric choices! Hi- new follower here! 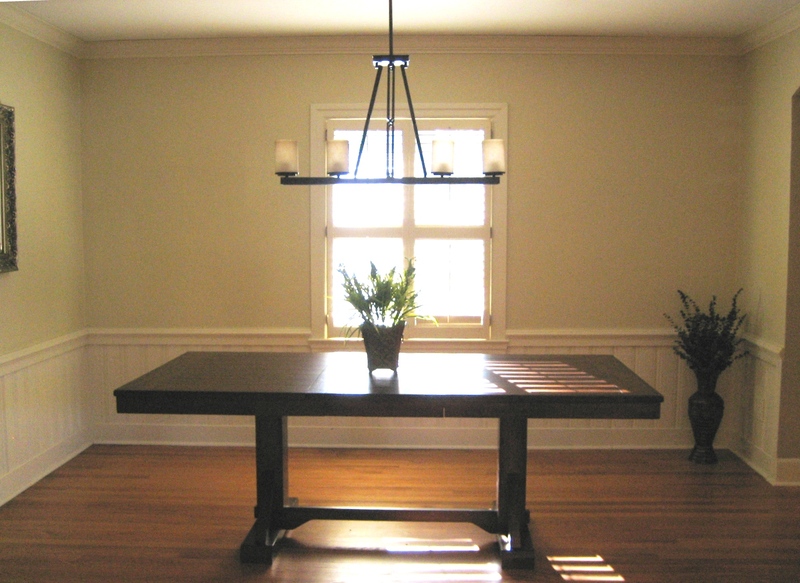 Your dining room looks fantastic! 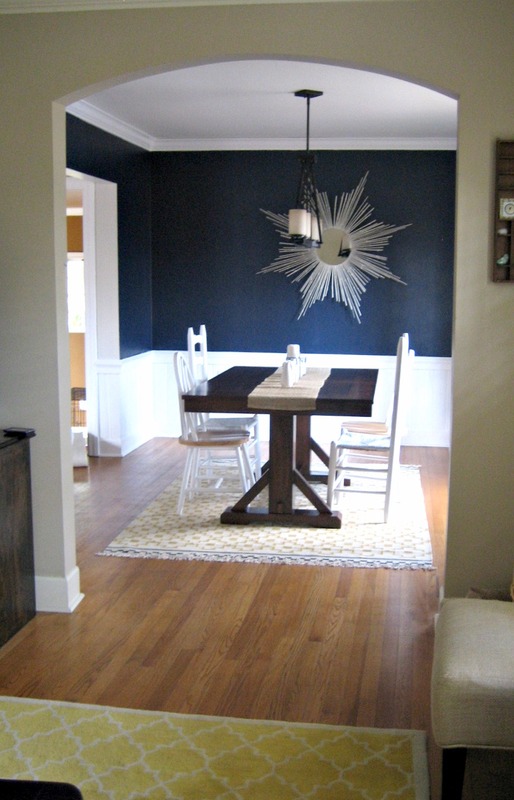 I've always loved navy as a paint color- especially in a dining room. love the navy! it looks perfect! i love it! who knew navy is the new "neutral" ? Seriously love it! It makes all the difference. Amazing transformation! You must be so pleased. ps- I have the same pineapple area rug. Love it! it looks awesome! i am so glad you went for it! so dramatic! I agree - it's gorgeous!!! I with I had the guts to do that! so so glad you did it! Love it! Love it, looks great with the white trim, very fresh looking! What a great colour! Looks fab. The wine rack wall is a great idea. I don't think you will see much of the wallpaper if you put it on the wall behind the bottles? Love how classic navy with white trim is = so exciting that you took the plunge! What a dramatic change! WOW!! I am Loving the navy blue!! So gorgeous with all the detail in your room. love it michelle! 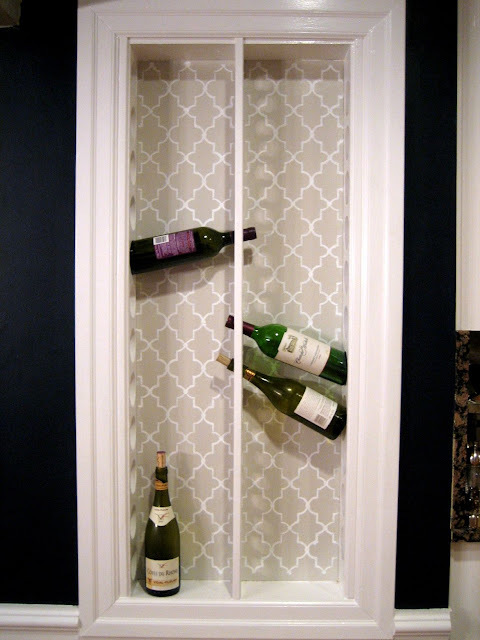 PLEASE PLEASE PLEASE do wallpaper in the back of the wine rack! It would look amazing! Looks awesome, can't wait to see what happens in there next! it's beautiful! What a great choice! It's gorgeous!!! Love it with the white trim and the peek of yellow rug from the other room! I painted a guest bath navy 5 years ago and have yet to tire of it! That looks amazing!! =] I love how it turned out! I LOOOOVE the navy!!! I was just at Target today and saw they have some very cool navy and white modern accessories and was trying to think which room I could do in navy and white! I am going to have a crayola box in our house but that's ok. :) Great job girl. Hi Michelle! Thanks for visiting my blog! That's awesome that you live in ATL as well. Maybe we'll have to do a blogger get together sometime too! ;-) I love this navy! 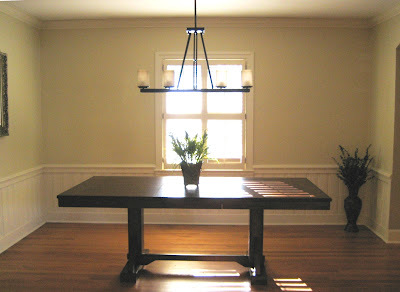 It's something that I've had in my mind to do with a dining room once I get one! I love it! You have great taste and can't wait to explore your blog some more! GORGEOUS. I really, really love it! The navy is perfect. And I'm even more engaged because I've picked an uber dark grey in the dining room with white wainscoting. Excited! I love the navy. My BFF just painted her family room navy with white furniture. And I would say a funky wallpaper or fabric for your wine rack wall! The room looks amazing. I can see it glowing at night by candlelight. You don't show the ceiling - are you thinking about doing something simple there? I totally just jumped over to your blog for the first time because I saw the picture of the navy blue walls. LOVE IT!!! I love navy with gold :) And I think a great graphic wallpaper would be awesome for the wine case. Have fun decorating! The room looks great. Love the navy, love the rug, and love the stenciling on your rack. I think you've given me the courage to try to do some stenciling on my built-ins. I just love it! You are right, it was a risk, but it turned out beautifully! I think it plays well with the dark counter tops I see peeking from the kitchen...the white and dark thing... Very nice! It's stunning! And I love the two rugs together - similar enough but opposites. AMAZING! What a great color. 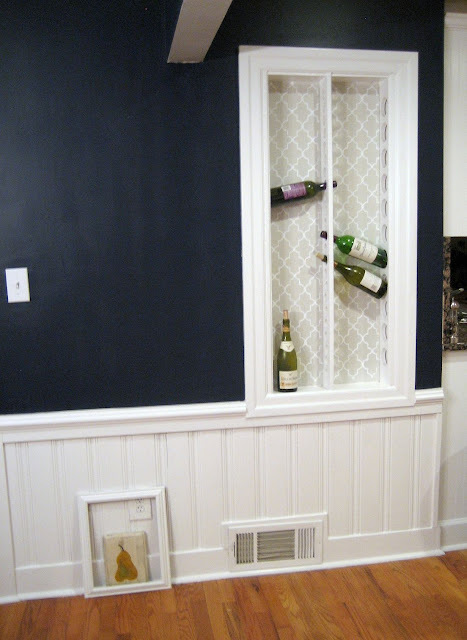 And, I really love what you've done to create wine rack ... especially the great stencil. i love love love love love! i am glad people talked you into this! i am always hesitant (meaning i have never done it!) painting with really dark colors.. and really bright colors.. and other colors.. : ) it looks so great! definitely good risk. Wow - I absolutely love it! My husband really wants a dark blue dining room but I've been biting my lip. After seeing your post, I'm ready to jump on board. Great job! I love the color you painted the walls. Really amazing. I am hosting a blog party that opens in a few minutes. I would love for you to stop by and join in the fun. Your room looks fabulous! I love the contrast of the white and blue. I just redid my half bath in these colors. You can see it at my blog if you would like to take a look. LOVE the navy wall color!! I fell in love with it after seeing it in the west elm catalog!! Question.. can you tell me what the color is on your kitchen & living room walls? I want that same color in my kitchen! Thank you!!! 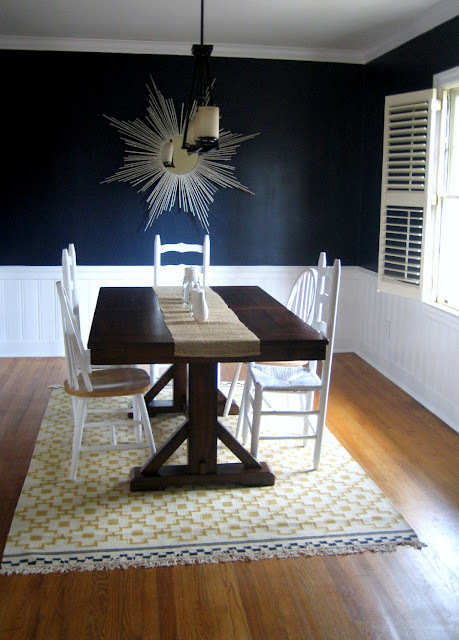 Saw your dining room photo on Houzz and it brought me to your blog. What a great job you've done with your entire house. Quick question: You mentioned the Behr color, but I'm wondering what sheen you used and if your walls are textured. They look a little glossy, but that doesn't always work with textured walls. Thanks.